New series exploring nature that has had a profound impact on human culture and society across history. Staring into the eyes of an ape is like looking in the mirror of humanity. 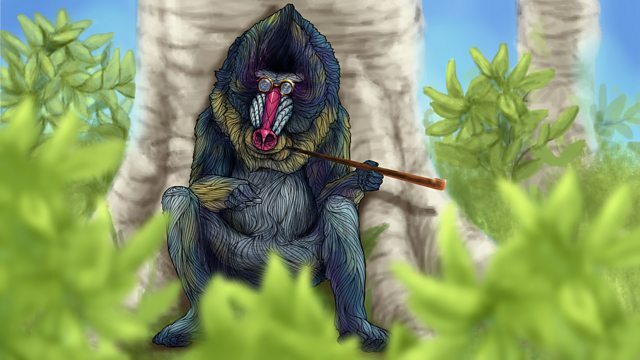 Happy Jerry was a mandrill who found his way to London on a slave ship and ended up smoking a pipe and having dinner with the king. It is a curious tale of humanity in search of itself. Peering into the eyes of a primate we see a reflection of ourselves and that has been an enduring fascination through time. It was thought in the 18th Century that the only reason chimps didn't talk in front of people was because they were afraid we would enslave them. From King Kong to the PG Tea chimps, we have exploited their similarity to ourselves to create fear and humour. They are so similar yet so different, so close to our behaviour yet they shock and appal us with their distinctly animal like traits. In Victorian times gorillas were often presented in museums in a ferocious pose charging towards the observer, a pose more reflecting the fact it was being shot at and defending itself rather than a true likeness of the reality of ape life. Today however they are seen as dignified vegetarians of the forest, huge yet gentle, demanding our hushed respect. Documentaries on primates are always amongst the most popular as we pick apart their lives for yet ever more detailed clues about how we are alike yet still worlds apart. Test your knowledge of monkeys and apes in the movies. Fascinating facts about the creatures most like us. Mr A. Mandrill has had enough. He's trying to bring a legal case against the human race. Richard Sabin explains why comparative anatomist Edward Tyson is his Natural History Hero. Natural Histories producer Mary Colwell writes about our attempts to understand apes. A selection of programmes and clips about monkeys and apes. See the Natural History Museum specimen discussed in the programme. Richard Sabin is Principal Curator in the Department of Life Sciences at the Natural History Museum, specialising in the study of the form and function of marine mammal skeletal anatomy. He is special advisor to the NHM’s UK Strandings Project, carries out endangered species identification work for UK and international law enforcement, and develops internationally recognised protocols and techniques for the extraction of genetic material from the Museum's research specimens. Erica Fudge is Professor of English Studies at the University of Strathclyde in Glasgow. She is the author of a number of books and essays on human-animal relations in the English Renaissance and in the contemporary age. Her work has also appeared in History Today magazine. She is the director of the British Animal Studies Network. John Ó Maoilearca is Professor of Film and Television Studies at Kingston University, London. He has published 10 books, including (as author) Bergson and Philosophy, Post-Continental Philosophy: An Outline, Philosophy and the Moving Image: Refractions of Reality, and as editor Laruelle and Non-Philosophy and The Bloomsbury Companion to Continental Philosophy . His latest book – on animals, cinema, and philosophy – is entitled All Thoughts Are Equal: Laruelle and Nonhuman Philosophy. Ian Redmond is a tropical field biologist and conservationist. Since studying and protecting the mountain gorillas of Rwanda and Zaire, working for the late Dr Dian Fossey, and then making the first study of the underground elephants of Mt Elgon, Kenya, Ian has devoted his life to putting conservation principles into practice through investigation, education and advocacy. He worked behind the scenes and on screen in numerous documentaries and was responsible for introducing Sir David Attenborough to mountain gorillas in 1978 for the famous BBC Life on Earth sequences and he taught Sigourney Weaver to grunt like a gorilla in 1987 for her award-winning role in the film Gorillas in the Mist. More recently he advised on the 3D movie The Last of the Great Apes. Charlotte Uhlenbroek has a PhD in chimpanzee communication and has presented several TV programmes for the BBC 1, including Cousins, Talking with Animals and Jungle. She is a Fellow of the Society of Biology, was vice-president of Fauna and Flora International, is patron of the Kathmandu Animal Treatment Centre and supports many other wildlife organisations. Which of these species have vanished? Scientists celebrate the pioneers who inspired their work and lives. Humorous perspectives on life from the plants and animals in the series. Dinosaur myths, misconceptions and mysteries.